Admittedly there are one or two episodes where one of the humans does some killing and/or we don't see everyone die, but fundamentally this series is a loop of violent murder... for laughs. It's not permanent, though. Everyone will be alive again without explanation in the next episode and so the cycle continues. The humans don't get that much characterisation, but it's not too bad for three-minute episodes. There's one fun character (the girl, Mika) and the three boys all have traits that let you distinguish them. Mika is cute most of the time, but if annoyed can become an aggressive, threatening thug. There's even a song about it in ep.6, as the boys go to peep on her in the shower. (Bad idea.) She also has a crush on Takurou, which makes her scary in ep.3. She's great. Of the three boys, Hiroshi is brainy, Takeshi is timorous and Takurou is a tough guy. The animation's very cheap, by the way, but that's fine. It's a horror-comedy with no interest in realism. It's fun. You'll have to be okay with everyone getting killed every three minutes, but I enjoyed the series. It's cute and it made me laugh. It's more memorable than most three-minute shows. I watched it partly because it only has three-minute episodes, so why not, but conversely I think it does well at inhabiting this format and making each episode feel as if it's the right length. I also particularly liked the way the last two episodes play with the show's format, giving the show a good ending. 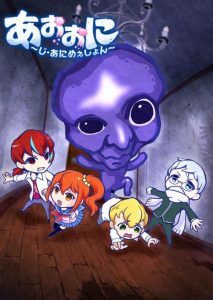 I'm even now interested in watching other versions of Ao Oni, even though I'm not expecting them to share this comedic tone. Recommended. I think it entertained me more than any straight short-form horror anime I've seen recently, for a start.